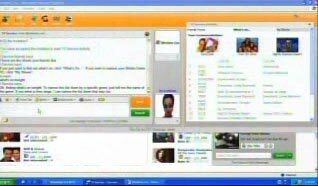 Earlier this week a free library was released which allows developers to connect to the MSN Messenger server. Kwerty Messenger Library has been written in .NET (presumably VB.Net) and uses MSNP8 (unfortunately, this means that it does not support DPs, or any of the other goodies that MSN Messenger 6 and upwards support). The library can be used to, for example, build your own BOT using the .NET framework (C#, VB.NET, etc). Creator of the library andre has also provided an example project written in VB.NET, which can be downloaded from the library's homepage. >> Download Kwerty Messenger Library (Beta 0.0.2204.21276, released January 12th). >> Report bugs, give testimonials, show us your projects at the Kwerty homepage/forums. Does it take you ages to sign in? Do some of your instant messages fail to reach your buddies? Do video or audio conversations conversations work on your computer? Microsoft is truly interested in common problems you are facing when using Messenger. - The percentage of people unable to sign in. - The average time it takes to sign in. - The number of sent messages that never reach the recipient. - The percentage of people that suddenly get disconnected. - The percentage of people unable to establish an audio conversation. Nothing Big Brother-ish at all, as you can see. In fact, we recommend you enable the CEIP because it will improve the Messenger experience for us all! >> Go to Tools > Options, then click the General tab and tick the box next to "Allow Microsoft to collect anonymous information about how I use MSN Messenger [or Messenger BETA]" right under "Quality Improvement". Trust me, you don't want a taste of Spymaster.A. It's a dangerous trojan that logs anything from the programs you run and the files you create/rename or delete, over the sites you visit to just about anything you type on your keyboard. All the gathered information is stored in a log file (Windows\System\syslogy.cc) and then sent to an FTP server for possible abuse. Spymaster.A can reach computers via web pages, P2P & IM-software or infected media, but it's usually distributed via email in a message that contains an attached file (usually) called SERVER.EXE. Once it is executed, a copy will be created (Windows\System\syscont.exe) and the process associated to this file is Win servico, however -and this is why we're reporting this- it uses a stealth system by which if the user views active processes in the Task Manager, they will only see it as a process supposedly corresponding to MSN Messenger! This process actually hides the actions of Spymaster.A so you won't notice it. Now don't go terminating your MSN Messenger processes just yet. At the moment this trojan has a very low distribution level. But if you want to sleep on both ears tonight, run Panda Software's free online virus scanner. It will detect and delete Spymaster.A for you... if necessary. >> More information Panda Software's Virus Encyclopedia. Raja Abburi, general manager of Microsoft's communication-client products, will be leaving the company on February 15th. With Abburi, Microsoft loses it's third key manager in less than a year, but instead of deserting in favor of Google or Yahoo!, he is leaving to pursue his own venture in the Seattle area. "I've always wanted to do a startup," the 40 year old native of India told a Seattle Times technology reporter. Responsible for one of MSN's increasingly successful products, MSN Messenger, Abburi surprisingly leaves on a peak moment. "There's never a good time, so as the next wave of [Windows Live] products start, I thought it was a good time," he said in the same interview. Mess.be joined Raja Abburi twice for a chat about MSN Messenger. A very long time ago in October 2002 (read the transcript) and then in the beginning of last year (summary & transcript). Microsoft's Macintosh Business Unit (Mac BU) today announced at Macworld Conference & Expo 2006 a formal five-year agreement that reinforces Microsoft's plans to develop Microsoft Office for Mac software for both PowerPC- and Intel-based Macs. A new version of Messenger for Mac has been mentioned as well, and will specifically meet enterprise needs. The Mac BU will release new features that continue to make Messenger for Mac an ideal messaging application for Mac enterprise customers. While the current version of Messenger for Mac provides more secure messaging and file transfers within the firewall, Messenger for Mac 5.1 will allow users to send files more securely (encrypted!) to external contacts. The updated version also will be better able to determine a user's location and where to send the message if the user is logged into Microsoft Office Live Communications Server on more than one machine. In addition, IT managers will have improved control over how they save chats at an organizational level. Messenger 5.1 is expected to be released in March. Now where's RJT when there's some good news? - 2005 saw a dramatic increase in the number of mutating attacks: with 140 total mutations and detection on all the major IM networks, the Kelvir worm was the leader, followed by Bropia with 29 mutations. - 2005 also saw attackers using worms that took advantage of multi-stacked clients (for example, Windows Messenger) and worms that included support for multiple languages to enable threats to more easily traverse geographic and regional boundaries. 2. Expanded IM functionality will increase the number of attack vectors: The convergence of IM, VoIP, virtual conferencing and other real-time communication capabilities will provide new opportunities for the propagation of sophisticated IM attacks. Let's hope Microsoft secures Windows Live Messenger good then. 3. More sophisticated and even "intelligent" worms will increase infection rates. Maybe some of the bots you'll talk to in 2006 might not be so friendly as they seem! 4. Instant messaging will continue to attract cyber-criminals: Cyber-criminals will increasingly be drawn to IM because of its proven ability to efficiently deliver malicious payloads via social engineering tactics. 5. Intellectual property leaks from internal threats will drive financial loss (if you're using IM in your company, that is). Don't become a victim of these increased security attacks. Be very cautious with file transfers and hyperlinks in conversation windows, especially those that come out of the blue. Always verify their content with your contact verbally. You might have noticed this already when you visited mobile.msn.com or the new mobile.live.com URL during the past few days, but now it's official: Windows Live BETA is publicly available for all mobile users! >> Mobile main example screenshot. - Windows Live Mail Beta for Mobile (replacement for Hotmail) has a cleaner design, easier and more consistent navigation (eg. "1" is previous, "3" is next, "7" is delete) with less action confirmations, more content on screen, etc. Windows Live Mail Beta for Mobile is available in the US, UK, Japan, France, China, Canada, Australia, Germany, Brazil, Spain and Italy. >> Windows Live Mail Inbox example screenshot. 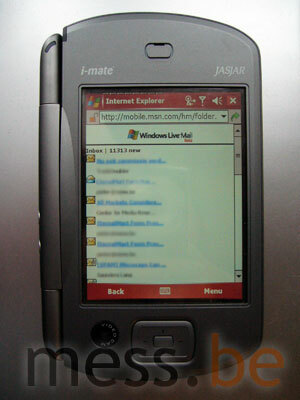 >> Windows Live Mail Inbox live in action on a PDA. - Windows Live Search Beta for Mobile shows the same results as a web search on your PC (with search.msn.com), and HTML capable phones are directed to the original html page or can choose to view the mobile version. You can also search MSN Spaces for content by keyword, and a lot of improvements have been made to local searches which also works via SMS (US only)! Just send an SMS to WLIVE and type the local search item with zipcode in the message body (eg. pizza 98008). The browser version of Windows Live Search Beta for Mobile is available in the US (+ local), UK, France, Canada, Germany, Spain and Italy. The SMS version is a managed beta only available to US Cingular consumers. >> Windows Live Search Local example screenshot. 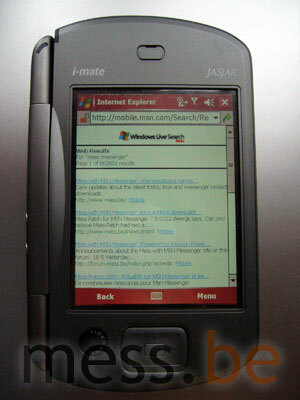 >> Windows Live Search results live in action on a PDA. - MSN Spaces Beta for Mobile is now available in more markets: UK, France, Canada, Australia, Germany and India. The features remain the same as those available to Japan and the US since August 12th 2005 (v10.5): create a space and manage it, view blog entries, their comments and photos, add blog entries and comments, etc. >> MSN Spaces BETA example screenshot. Whoa! Thanks to our lovely community of open-handed Messers, we will be able to offer an official Windows Live Messenger invite not just to six, but to everyone whose Mess with the new WLM Buddy submission gets selected for the CustoMess MSN Display Picture pack. You have one day left before we stop accepting your contest entries, so fire up Photoshop and get into some cut 'n paste 'n clone action! More info here. No worries if you lack proper image editing skins, another WLM 8.0 BETA invitation giveaway is already ready for launch! If you have offered us your invites already, expect a message from me soon. If you haven't but want to, send them livebuddy mess.be (please don't copy-paste this addy but type it over completely). Thanks! Bloggies are for blogs what Oscars are for movies. In March the sixth annual Weblog Awards ceremony will be held in Austin, Texas, USA but no winners without nominees. Dear Messers, I'm not trying to suggest anything here, but don't you think Mess with MSN Messenger (www.mess.be) would look flashy in the categories Best European Weblog, Best Computers/Technology Weblog or even Weblog of the year? Hell, why not? In 2001 we started as a non-professional weblog "avant la lettre", you know, before the whole blogging craze. And now, with almost 20 million unique visitors in 2005 we're a blooming community with more extra content than your average *cough*Gawker*cough* blog :p Time for this site to step out of the shadow, methinks! The competition is fierce, and the noms close tonight (Tuesday, January 10th at 10:00PM EST), so please vote NOW! - E-mail addresses are required to vote. You must use your own address. - You do not have to make nominations in each category, and you are allowed to nominate just one site per category. - But: at least three (3) different weblogs total must be nominated. In the same webcast we posted last week, Corporate Vice President for Windows, Joe Belfiore, demonstrates a new Windows Live Messenger service that links up with the Windows Media Center operating system. "Hi, Joe, would you like some help figuring what to watch. The TV service is inviting me to start a TV service activity. [...] when I click accept you can see over here it presents me with a bunch of interactivity. The service says, these are the shows your friends like. That's kind of an interesting thing. Immediately the idea of community becomes something that's factored in and the service can use to do a better job of helping me find things that I like. It knows who my buddies are because I've signed up with buddies, and as Bill described, if I choose to share information about my preferences, and what I like, then that could be used to make everyone's experiences better. So, these are shows that my buddies like. I can just move over there and choose one of those to record. And instantly, the service can find promotional material, trailers, background information on content I might be interested, and it starts streaming it to me directly so that I get better information up. It says, if you like this trailer, would like to record it let me know. OK, record it. It finds my Media Center PC, sets up the recording, and now in the future I'll have this show available to watch when it's convenient for me." >> Watch Bill Gates' CES keynote speech: 56k, 100k or 300k speed/quality (fast forward to +-1:06:40).